Spring is here! We only have a little over seven weeks of school left to complete. Thank you for choosing Legacy Academy for your student’s education! Very Important! After April 30, 2017, students will not be allowed to charge hot lunch. The time for our annual fundraiser is coming up quickly. We are very excited to be holding our Community Carnival Saturday, April 29, 2017, here at Legacy. We could use all the help we can get. What a fun way to get your volunteer hours in by helping out. If you would like to help coordinate, please feel free to contact Kathy Smith via email kathy.smith@legacyk8.org. Students third through eighth grade are on a testing schedule Tuesday, April 4, 2017, through Friday, April 7, 2017. Please make sure students have a good night sleep, a great breakfast, and are on time. Students who arrive after 8:15 am, will be held in the office until the first test is completed. We love our volunteers! However, we are not allowed to have volunteers in the building during our testing window Tuesday, April 4, 2017, through Friday, April 7, 2017. Thank you for your understanding! We are looking for volunteers to help with our graduations on Friday, May 12 – Kindergarten Graduation at 5:30 pm, and Monday, May 15 Eighth Grade Graduation at 6:00 pm. Summer Mowing & Weed Whacking. We are putting together a team for summer lawn care. We will need to mow and weed whack the property three times over the summer. Friendly Reminder: If your student is out sick and has a doctor’s visit, please have the Dr. fill out a note to give to the school so we can make a note of it in attendance and add it to their file. Tuesday, April 4 ~ Second Grade field trip to Jungle Book Encore. Please make sure to send a sack lunch with your second grader! Jump for Heart Dress of Choice (No Fee). This is a reward for all Legacy Academy students for raising over $7,000.00 for Jump for Heart! Students who won a t-shirt from Jump for Heart are encouraged to wear it! Sunday, April 16 ~ Happy Easter! School Board Elections, please stop by the school between the hours of 7:00 am to 6:00 pm. Fifth through Seventh-grade “Girls Night Out” field trip to Bowlmor. Wednesday, April 26 ~ An author, Linda Reincke will be in the building to read to students K- 5th. She will have books available to purchase, more information to follow. Sunday, April 30 ~ Eighth grade depart for DC/Philadelphia/New York Trip! 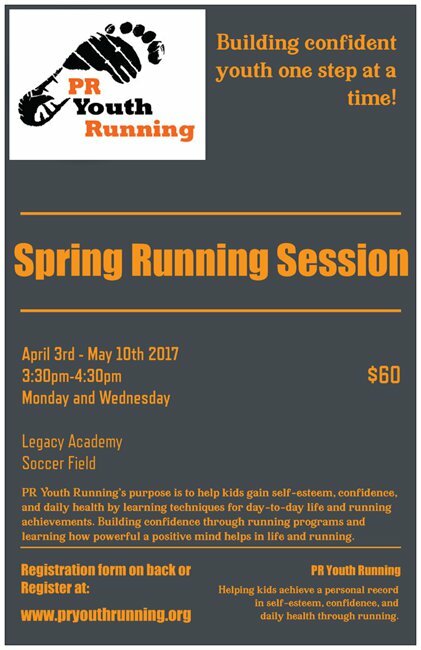 PR Youth Running is a 501(c)(3) non-profit youth running club. PR Youth Running’s purpose is to help kids gain self-esteem, confidence, and health by learning techniques to excel in day-to-day life. We build self-esteem and confidence by using physical education as a tool to teach youth how powerful a positive mind is in life and running. This club is for Kinder through 5th grade. Hello to all Parents and Staff of Legacy Academy. The time is fast approaching when you will be called upon to elect directors to the Legacy Academy Board. There is one open seat this year (Kathy Smith). Each seat is for a three-year term.If you have questions about serving on the board, please email kurt.naber@legacyk8.org or dallas.schroeder@legacyk8.org. • Family Background – please give a brief description of your family background, occupation, and interests. • Education Philosophy – please describe your educational philosophy and how you see it fulfilling the vision of Legacy Academy. • Mission Statement Interpretation – please describe your interpretation of Legacy Academy’s Mission Statement and how you envision a board member’s responsibility for implementing it. Commitment to Legacy Academy – please describe your understanding and commitment to Legacy Academy. 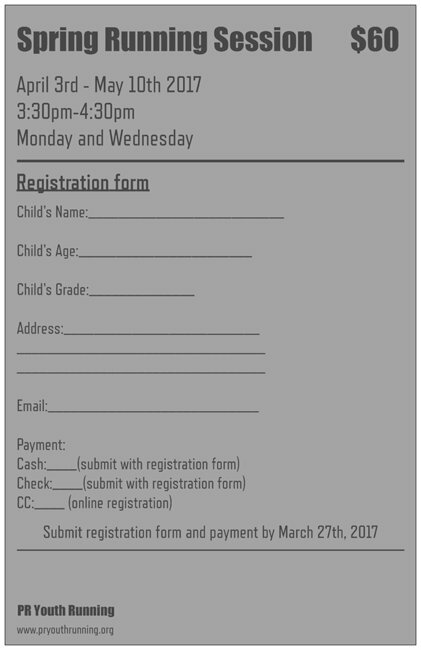 All submissions are due by Thursday, March 30, 2017, and should be submitted to Jessicca Marks at jessicca.marks@legacyk8.org. The Community Carnival is right around the corner. This year it will be held on Sat. April 29th from 12 – 4. There will be inflatables, carnival games, face painting, a photo booth, cake walk, dunk tank, teacher jail, and food! We would LOVE to have all of your support with this fundraiser! We are asking for different donations to help with the carnival and remember that for every $10 spent you get one volunteer hour. Thank you for your consideration. We are notifying all families that student attendance the rest of this quarter is especially important as we will be doing spring assessments. These spring assessment scores are critical for both parents and teachers. They allow parents to get an idea of how their student is doing academically, and aid teachers in nest year’s educational plans. Additionally, some assessments begin promptly at 8:10, so we need all students to arrive at school not later than 7:55. This gives us time to take attendance, the lunch count, and get everyone settled. It also allows for quiet hallways, so those who are testing have a chance to do their best. Specific assessment dates will be communicated in the Legacy Ledger. Dear Parents, Thank you to those of you who have sent pictures for the yearbook. I still need pictures from kindergarten, crazy hair day, the Fun Run, and any candid pictures of your students. Please email them to jessicca.marks@legacyk8.org. Tuesday, March 14 ~ PTCO General Meeting at 5:30pm (Free Childcare Provided). The Mother/Son Amazing Race this Friday! This Friday is a dress-of-choice day for everyone. We will have Spring Photos for all students. Props (for example a football/teddy bear) are allowed! A proof of the picture will be sent home for you to review and you will be able to decide if you want to purchase a packet. We are in the process of putting the yearbook together. We are in need of pictures. If you have attended any of our special events, class parties or sports events, and took pictures, those pictures would make a great addition to the yearbook. Please email them to jessicca.marks@legacyk8.org.